"Corporate Performace Management: A Case Study Approach to Accelerating CPM Results"
The teams we work with leveraged the real time voice of the customer surveys, net promoter scoring, internal and external benchmarking, creative exercises, prioritization techniques, and more. Consider this book a field guide that you can readily apply to your organization. It provides practical executive and management examples, and it is brimming with insights and tools to help you achieve results. 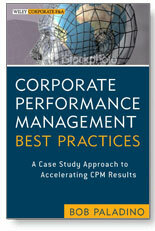 Corporate Performance Best Practices will help improve performance in your organization. "Our school was struggling to find a corporate performance model that we felt would work in the public sector and Bob's pragmatic approach worked perfectly for us in developing a balance scorecard that we found to be a key strategic tool in addressing today's world of increased accountability for educational institutions. We've used Bob Paladino's teachings as a "how to" guide in helping us to become a mission focused, data driven organization. This should be required reading in every "Principles of Educational Administration" course offered for a school superintendent's credential by our Colleges and Universities. If more of our country's school administrators used Bob Paladino's CPM key principles in their day-to-day operations, I'm convinced we would all feel better about the state of public education in America." "Industry awards are always appreciated, but the true reward for organizations that conduct benchmarking and adopt best practices and effective performance management systems is superior financial results year after year. Bob Paladino's chronicle of MidMichigan Health's efforts shares how the hospital chain's leaders applied countless best practices in corporate performance management to benefit doctors, employees, and-most of all-patients, improving both the system's financial position and service within its communities. It's an impressive journey worth reading and following." "Bob Paladino's writing blends his skill as a business leader, consultant and teacher to deliver guidance that can harness the power of integrated effort toward the same goal. As you read it, you can visualize the difference it makes when individuals and departments are working with a compelling and clear end in mind all while chartering their improvement and progress toward the goal. Whether Bob is "hands on" helping businesses achieve the performance they desire or putting his principles into a guidebook for business leaders, he always leaves you and your organization with a different mindset and a set of tools to raise the bar and achieve far more than what existed before. For any business leader wanting to accelerate performance and get his or her organization moving in a new direction, Bob's CPM Best Practices supplies the roadmap, toolkit and guidance. With just a few talented people who believe in your vision and the principles in Bob's book, you can achieve your mission and achieve results that your team probably didn't imagine possible." "My management team and other key personnel attended several workshops conducted by Bob Paladino. Through this process we have established a more systematic approach to identifying business/growth opportunities; prioritizing projects based on their potential value to the Company; developing business cases for the identified opportunities; executing plans to make the business opportunities a reality, and; monitoring and measuring the success of our progress toward achieving the established goals. Bob has a lot of insight and a strong grasp on what it takes to achieve success". President & CEO, Laurel Highland Total Communications, Inc.
"Regardless of the size of your organization, Bob Paladino's strategic expertise can provide you with both a practical and realistic guide for improving performance. He has a unique way of showcasing the best aspects of a company and how it achieved breakthrough results by designing, developing and implementing a strategic plan supported by a solid CPM system." "Bob Paladino's career experience as a chief performance officer comes to light in this book that provides a roadmap for any company to accelerate its business improvement program. The book is grounded in actual case studies, so no there is no theory rather practical template to improve your financial, customer, process and people results; public, nonprofit and government organizations take note." "Bob illuminates a clear path to developing and executing Corporate Performance Management. This proven, easily-understood and executed method to connect strategy, metrics and performance management is one from which companies of any size can benefit." "Many companies struggle to successfully implement Best Practices and drive Strategy through their organization. Bob Paladino transforms theoretical approaches and applies them to real life case studies by sharing the ways companies have adopted and adapted the use of the Balanced Scorecard and Performance Management within their companies. Bob continues to demonstrate that success is possible no matter the industry, the size of the company or the operating culture." "Bob Paladino's straight-forward, easy-to-use methods, break down the obstacles keeping organizations from world-class performance. This book extends Bob's approach with tools to make even the best organizations better." Manager, Strategy Analytics & Business Intelligence Mueller, Inc.
"Much has been written about the theory of creating strategic alignment and creating a sustainable improvement system. Theory is sometimes hard to implement. Bob leverages his practical experiences in showing how his concepts have been implemented and proven successful. His are the best "how-to" books on the subject." Are you ready to learn how CPM can help you? Check out the book on Amazon and buy your copy today.